The utility industry ranks as one of the most regulated on the planet. The acronyms representing the myriad organizations that CPS Energy must satisfy–from the PUC and FERC to the NERC, EPA, and TCEQ–could fill a dictionary. It takes dozens of specially trained technicians, analysts and engineers to make sure CPS Energy complies with the thousands of regulations mandated by these entities and to ensure we keep the community, the power supply and our water and air quality safe. James Partridge works as one of 10 Environmental Lab technicians that help CPS Energy stay in compliance. He spends his days at the utility’s power plant facilities gathering water samples, then examining those water drops with a microscope. 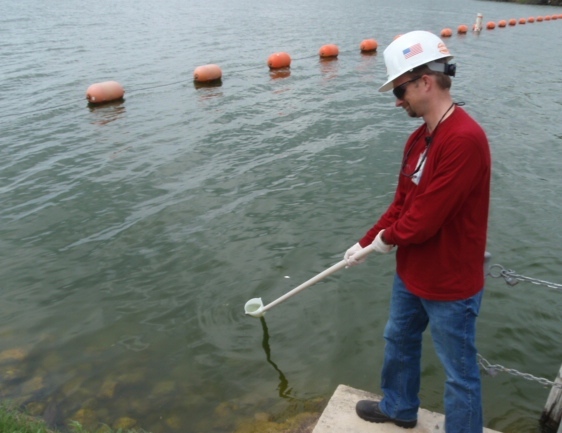 James Partridge gathers water samples at Calaveras Lake for sampling back at the lab. transitioned to Environmental Operations after three years. On weekends he keeps busy cheering for his sons Vance, 7, and Harrison, 3, at their Saturday soccer or baseball games. He also volunteers at his church and works with the youth there as an assistant Boy Scout master. We sat down with Partridge to hear about his important work. What does it mean to be an environmental lab tech for CPS Energy? I’m one of 10 Environmental Technicians who serve as stewards of the environment. We’re the eyes and ears of CPS Energy, making sure we abide by all state and federal regulations. We work to keep the San Antonio community ecosystem healthy and make sure that in the process of producing affordable, reliable power, we don’t compromise our air or water supply. My uncle works for Universal City’s water department so I learned early on that water is a precious resource. Taking care of it appealed to me. Also, living in San Antonio, I knew there would always be a need. My job entails collecting and analyzing wastewater samples. I collect water from our cooling lakes, we run tests–everything from a simple temperature and pH test to more demanding analyses like oil, grease and biochemical content. We use standard lab testing methods. 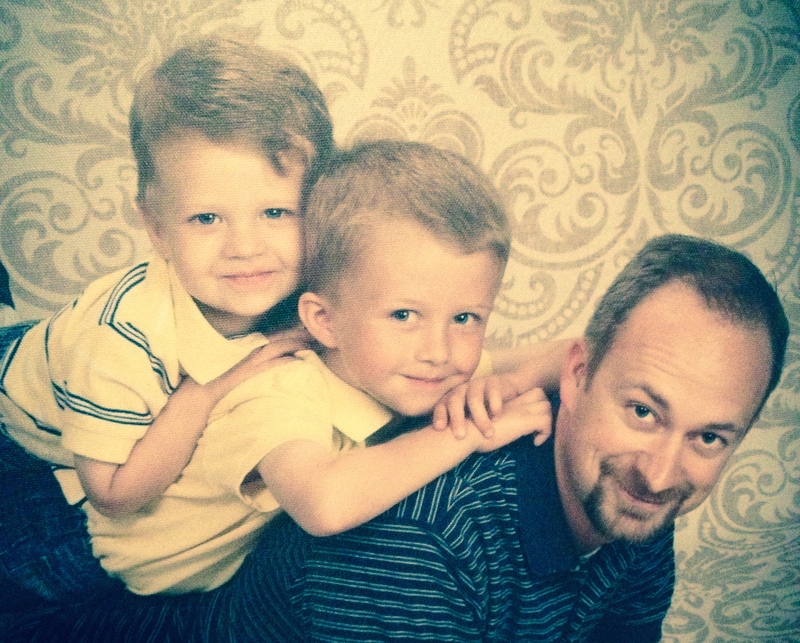 On weekends, Partridge attends soccer and baseball games with his two sons Harrison and Vance. After running the tests, I draft and submit reports to state and federal agencies, run and maintain clarifiers–which are special pieces of water treatment equipment that allow solids to settle and clean water to be discharged. We serve as the last line of defense to protect our environment and strive to keep it clean and safe for our employees and our community. What is the most challenging part of your job? The most interesting? What I enjoy most is working outside. I have always been an outdoorsman– camping as a kid. I hunt and fish. I’ve been very close to many water snakes when collecting samples, and have seen copperhead and rattlesnakes. I enjoy seeing all the beautiful waterfowl that migrate here during the winter and have witnessed the resident Osprey dive and catch fish in the lakes. 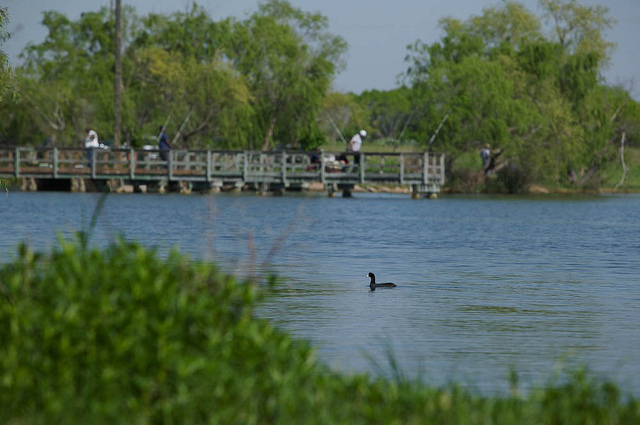 Partridge enjoys fishing, birdwatching, and the great outdoors of Calaveras Lake. My work gives me a great sense of accomplishment. There are many routine aspects to this job, for sure. But we are, in a sense, firefighters. We field any potential compliance issues at the power plants. We also monitor tank levels and check drains to prevent spills and make sure that any needed clean-up is handled correctly. Doing my part to help CPS Energy protect the community is very gratifying. The most challenging part is troubleshooting possible causes and determining solutions. Our routine work generally focuses on wastewater sampling. Also, many of the sites can be very stinky, since we sample at the hottest and coldest times and all the samples must be collected if they flow–no exceptions. When most people are getting out of the weather, we are out collecting storm water samples within two-hours.